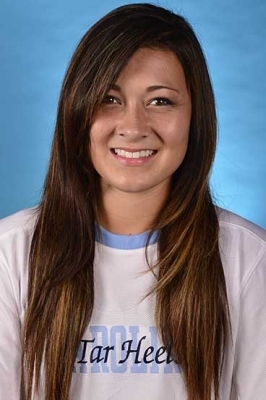 RICHMOND, VA (December 3, 2015) – If you search for Brooke Elby online, one of the first links you will find is a video titled “Brooke Elby saves UNC season.” Let’s set the scene for one of the most amazing plays in college soccer to date. In the YouTube video, No. 1 Brigham Young University and No. 2 University of North Carolina at Chapel Hill are playing in the quarterfinals of the 2012 Women’s College Cup. The game is tied 1-1 and five minutes remain in the game. North Carolina takes a corner kick, but when the trick play they had set up did not go as planned, the ball goes to the backfield straight to the BYU left back. The BYU left back places a perfect pass to her center back who blows past North Carolina’s goalie at the top of the 18 yard box, with a pass in standing between advancing to the final four. Just as the BYU player lines up her shot from the left side of the goal, the BYU bench erupts, you almost miss theblurry Brooke Elby come from the right side of the screen. She slides to block the shot, keeping the ball from hitting the back of the net. The play-by-play announcers said it was “season-saving for the Tar Heels,” and they were right. Elby’s tremendous play kept the game alive for North Carolina and pushed the game into double overtime where the Tar Heels ended up winning. Two games later, North Carolina won its 21st National Championship. As a kid growing up in Pasadena, Calif., she was an energetic child who was constantly running around. Her parents threw her into a bunch of different sports, but soccer is the one that ultimately stuck. “As time went on you couldn’t get me off the field,” Elby said in an interview last January. “I hated when my coach took me off. I just loved being on the field scoring goals.” She played for her high school team at Flintridge Preparatory School in addition to Arsenal FC, a current ECNL member club. 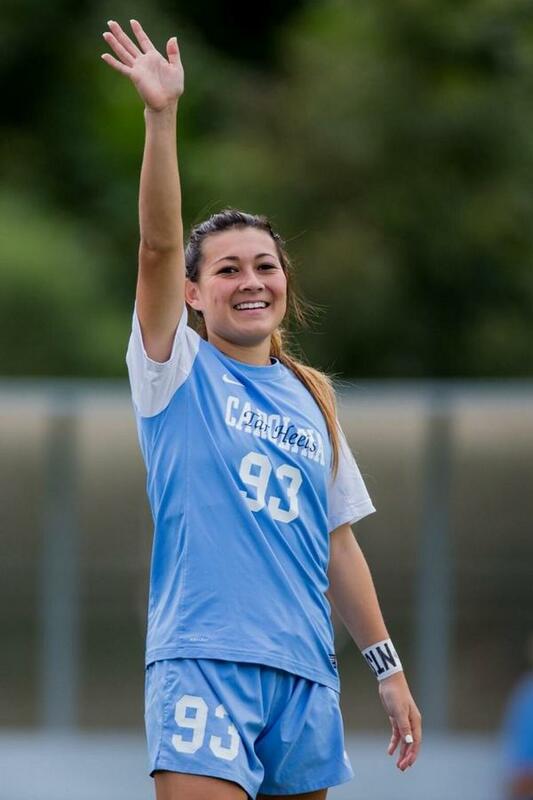 Elby committed to play for the Tar Heels, a dream for many elite female soccer players at the time. Elby gives everything she has when she steps on the field. She is always running on all cylinders, rarely leaving a game without slide tacking a handful of opponents. A slide tackle in a game against NC State left her with a devastating ACL and meniscus tear in September 2014, her senior season. She missed the redshirt cutoff by two games, “Right after I got injured I was in bed crying, and I gave up entirely. I told myself and others I did not want to play soccer ever again,” said Elby. She thought her entire soccer career was over at that moment. After the initial shock of the injury and the surgery, Elby had a talk with Coach Anson Dorrance that was a turning point in her recovery. After playing some of her best games during her senior season, Dorrance told her that she could not let this be the end. Dorrance told her she could play professionally, and coming from a man who has coached dozens of the top players in the women’s game, those words resonated and inspired her to rethink her decision. This was a pivotal moment for Elby, as she began to tell herself that she could keep playing. Dorrance encouraged Elby to try out for the W League, a professional league in Australia. It is a four-month season that ends just before the National Women’s Soccer League (NWSL) season begins in February. In May, Elby graduated from the University of North Carolina at Chapel Hill with her degree in Journalism and Mass Communication. A few days later she was cleared to play soccer again. She trained with the Women’s Premier Soccer League (WPSL) in Southern California and individually Dave Copeland-Smith from Beast Mode Soccer until September when she took a huge leap of faith and flew herself to Australia to try out for the W-League. Copeland-Smith was a huge influence and convinced Elby to get on the plane to Melbourne. There is a restricted number of international players in the W League, so even though she had contacted several coaches beforehand, there was no guarantee that she would earn a spot on a team. “You should have seen me on the flight. I was a wreck,” she said about her journey to Australia. The first few days she was alone in a foreign country with all of her dreams depending on the tryout. All of her hard work paid off. She made the Melbourne Victory, and now lives with three of her teammates, spending her free time on the beautiful Australian beaches. Only months after surgery, Elby played in her first professional game. Unsure of what it would be like to be back on the field again, she was nervous. “My first game back was stressful,” said Elby. “I was terrified, but when I stepped onto the field it was like nothing had changed.” She was still as fearless on the field as ever, slide-tackling opponents left and right, but now much smarter about her decisions. Elby loved being back on the field again, and still has dreams of playing in the NWSL. After some negotiations through the efforts of her agent, the Boston Breakers made an offer to sign with them and join their program. “I was so happy. I wanted to yell it from a mountaintop. But I could not tell anyone until it was official,” said Elby about her initial excitement. Brooke Elby, you are an Amazing Young Woman and Congratulations on making it to the NWSL!